Where to find Concord hotels near an airport? Where can I find hotels in Concord that are near tourist attractions? If you choose to book a hotel near the center of Concord, there are a limited number of options. About 9 Expedia-listed accommodations lie within a 0.1-kilometre (0.06-mile) distance of Concord's center. Among the more central lodgings of downtown Concord are the The Centennial and Holiday Inn Concord Downtown. The Comfort Inn Concord is nicely located 2 kilometres (1 mile) from downtown Concord and is good for travelers who like to stretch their budget. 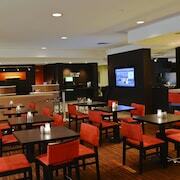 The Fairfield Inn By Marriott Concord is an alternative budget place to stay in Concord. You could try the The Bedford Village Inn or the Residence Inn by Marriott Concord. The The Bedford Village Inn is 30 kilometres (17 miles) from downtown Concord. The Residence Inn by Marriott Concord, is positioned 2 kilometres (1 mile) away. Other accommodation options worth looking into include the Hilton Garden Inn Manchester Downtown and the Holiday Inn Express Hotel & Suites Tilton - Lakes Region. If you plan to see more of the valleys and rolling hills in this section of United States of America, you could plan extra time in other parts of Southern New Hampshire. Spend time hiking and horse riding or visit the region's tourist attractions. Suitable accommodations are available. Nashua is 50 kilometres (31 miles) to the south of Concord and is home to the Pheasant Lane Mall and Daniel Webster College. 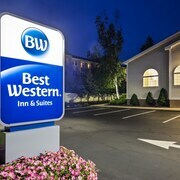 Some of our recommended Nashua hotel options are the Crowne Plaza Nashua and Courtyard by Marriott Nashua. 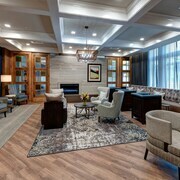 Or, you could stay in Merrimack, 40 kilometres (24 miles) to the south of Concord, where you can choose from the Residences at Daniel Webster and Holiday Inn Express & Suites Merrimack. The Merrimack Premium Outlets and Anheuser-Busch Brewery are popular sites to explore when you're in Merrimack. Before your Concord trip draws to a close, why not spend an afternoon cheering along with local sports enthusiasts at a local game. You'll find Verizon Wireless Arena 25 kilometres (16 miles) to the south of Concord. For those who are interested in booking a room nearby, make a reservation in the Radisson Hotel Manchester Downtown or Fairfield Inn & Suites by Marriott Hooksett. For those travelers planning on arriving or departing through Manchester-Boston Regional Airport, you may choose to book some accommodation at Homewood Suites by Hilton Manchester/Airport, or Holiday Inn Manchester Airport, both of which are a short ride away. What are the most popular Concord hotels? Are there hotels in other cities near Concord? 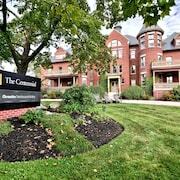 What other types of accommodations are available in Concord? Explore Concord with Expedia.ca’s Travel Guides to find the best flights, cars, holiday packages and more!